I have been bringing SSR Mining (TSX & NASDAQ : SSRM) on to the show over the past few months because I think they are a great example of a mid-tier who is generating good cash flow numbers and building cash in the bank. After my last interview I received a number of emails asking for more color on the recent investment in SilverCrest Metals. In this interview I have David Wiens, Director of Corporate Finance and Brian Martin, Director of Business Development on to discuss this investment. We also use this investment to discuss the trend of larger companies taking equity stakes in exploration companies rather than flat our buying them. If you have any follow up questions for the guys at SSR please email me at Fleck@kereport.com. Click here to visit the SSR Mining website for more information on the overall Company and SilverCrest investment. Look at GCC dump. 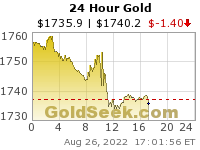 Down about 1% at 11 eastern–that is a big move. New low is incoming, probably sooner rather than later. I’ll bet the rest of the year is devoted to just crawling back up from its fresh new low–and that’s the bullish scenario. 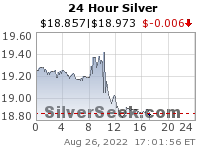 I think silver is at serious risk here. It more than likely will eventually track GCC lower. But whatever. Have to hand it to Powell. He knew exactly what he was doing and that there was zero risk that input prices would be rising anytime this year. All liquidity is being force fed into the US stock market by hook or by crook. GCC could get really ugly once the 2016 low is taken out. while GCC doesn’t go back 50 years, the CRB does. GCC has been much weaker than the CRB, which overweights oil. Since the CRB is basically at the same level is was in the mid to late 1970s, we can presume that GCC would be even lower, probably at pre 1970 levels. Think about that–that is in absolute terms not even adjusting for inflation. Adjusting for CPI would have the commodity complex at low dating back well before 1970. That is unbelievable. This historic drop in commodities is in the face of central blanks absolutely blowing up their balance sheets. It would be one think for commodities to stay flat in the face of that. but to drop to 40+ year lows? I’m sorry, I am calling BS on that! The more they print, the lower commodities go. Look closely and you’ll see that GCC also took much longer than gold and silver to finalize its low in 2016. It looks to me like silver and GCC converge eventually. Given how terrible GCC’s weekly chart looks, I am expecting silver to catch down to it, instead of vice versa. GCC’s week cloud is ominous as well. It is screaming that GCC has very limited upside. And if the 2016 low in GCC gives way, the losses could potentially be massive. I hope you are correct, but 2019 looks to be shaping up to be another sideways to down year, at least for silver and silver miners. USD rallying in the face of the FOMC is all that needs to be seen. Powell pulls a complete 180 from last October’s hawkishness and commodities proceed to head even lower. Not only did they not rally, they look like they are guaranteed to make a new lows. Absolutely nothing makes any sense. Nothing. The only thing that works is buying the dips in the US stock market since it is the ONLY thing still trending up. The final nail in the coffin for gold bugs will be seeing the US stock market make new all time highs as gold miners continue to scrape bottom for another few years. The weekly stochastics on the $indu:$crb chart haven’t hit oversold in 8 years. That hasn’t happened for as far back as I can see (back to 1956). The previous record was 6 years, between 1994 and 2000. Totally natural market behavior wouldn’t you say?